The venue Grosmont Crossing Club is quite small. In fact it’s tiny but we managed to squeeze in everyone and their ukes and it was fantastic to see some of the Eskuleles, most of whom have only being playing a matter of weeks, chatting with the GFS members and being given the obligatory Split Stroke tutorial. As you would imagine, a little place like Grosmont attracts a few characters and the star of the day was Jimmy. 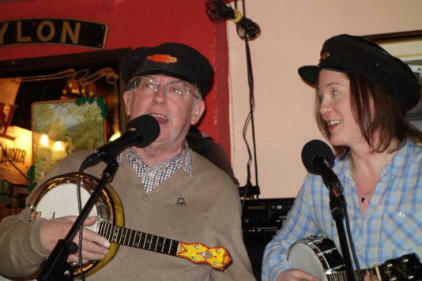 Well known locally as a guitarist, MC with an eye for the ladies he came in barefoot as usual, clutching two old banjo ukes that had perhaps seen better days but like most of us, just needed a bit of TLC! He was desperate to learn to play like Formby and went away clutching a piece of paper with DDUDD written on it. The Afternoon concert The afternoon concert kicked off at 3:15pm with a thrash much to the delight of those new to Formby. It was a very steep learning curve for me having never been an MC before but I was ably assisted and advised by Peter Pollard and Ian Walker. 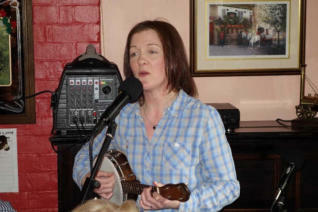 We had wonderful performances from those two and from Lawrie Tawn whose Yorkshireman song went down a treat. Grosmont Grosmont is a small village near Whitby in North Yorkshire. It has one pub, a private members club, the oldest independent Co-Operative in Britain, a railway station and is home to the Motive Power Department (engine sheds) of the North Yorkshire Moors Railway. Other than a few B&B’s, some nice tea rooms and a big hill whichever way you drive, that is just about all there is in Grosmont. Back in January a few hardy ukulele players struggled through deep snow into the village for the first ever George Formby day. Most people sensibly stayed at home as Britain ground to a halt due to the severe weather. Despite the low numbers we had a great day so undeterred, we decided to have another go in April when we hoped the weather would have improved. There was no snow but the temperatures were still pretty low. 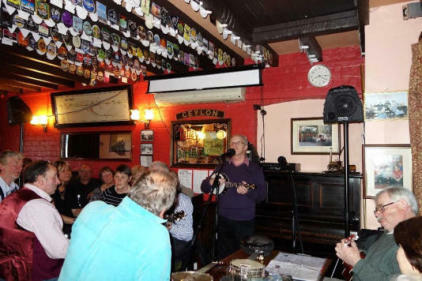 That wasn’t enough to stop ukulele players from across all parts of Yorkshire and the North East congregating in Grosmont Crossing Club. 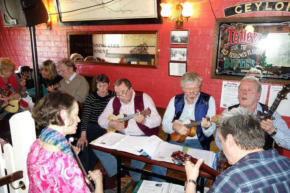 It was billed as a George Formby day but players from various ukulele clubs came along too. There were representatives from our very own George Formby Society, The Stockton to Darlington Ukulele Express (SDUE), The Hartlepool Ukulele Group (HUGS) and the newly formed local group, The Eskuleles as well as a few ‘independents’!